For the past few weeks I’ve been pretty much useless around the house. You may have read that my weekend warrior activities on the soccer field caught up with me when I was injured during a collision on the soccer field. What I had hoped was a knee sprain was revealed be a torn ACL and meniscus. After surgery, I had a month of not putting any weight on my right leg. That means in addition to having to cart me around (I could not drive), Dinah had to do lots of other things like bringing me coffee, taking over tasks I usually handle, and doing pretty much any task that required an adult with the ability to walk or stand for any length of time (I did find that I could fold clothes and wash dishes if it didn’t take too long). That has lead to an extended absence for me from the kitchen. Last Friday I began the process of walking again which allowed me to return to the kitchen with the ability to help with the cooking. I was eager to start helping again as I’ve seen how much work Dinah has had to do while I’ve been injured. Yesterday, Dinah showed me a recipe she wanted to try for supper. While I can walk, I’ve not yet been cleared to drive so she went and picked up the ingredients to make the soup. I decided to help in the kitchen and make this soup. I had to adapt it quite a bit because the original was designed to be prepared in a crock pot and we didn’t have that much time. The results of the adaptation were very successful (so successful I’m eating leftovers as I write this post). The final result was quite spicy because of the spicy Italian sausage so the boys opted for other options. That was fine for Dinah and I who both felt like this “adult” dish was a great meal with the colder temperatures outside. If you are looking for something to warm you up during the evening or if you are looking for a dish to make for your special someone to say “thank you for taking care of me while my knee healed” I think this dish is a great way to accomplish those purposes. In a large stock pot (I used an 8 quart pot), brown the sausage and then remove to drain. Set the sausage aside. In the drippings from the sausage, saute the onions until they are clear. Add the garlic and saute for about a minute (don’t burn the garlic). Add the water, chicken broth and potatoes to your pot. Bring to a boil then cook covered for 20 minutes or until your potatoes are soft. If you want, mash some of the potatoes (makes the soup a bit thicker). Add the drained sausage and kale to the soup and cook for another 5 minutes covered. Turn off heat and add the heavy whipping cream. 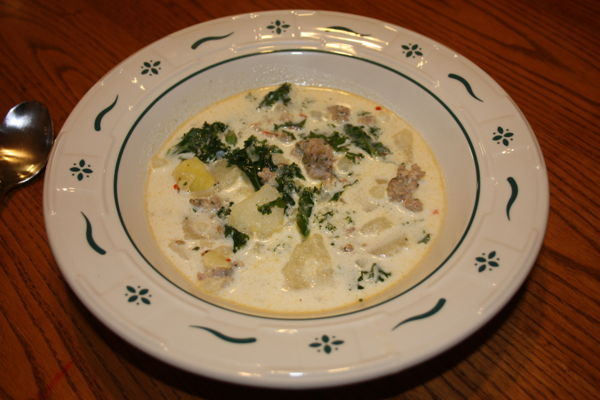 4 Comments on "Guest Post: G.F. Zuppa Toscana"
Looks and sounds like the soup that Kenny always orders when we go to Olive Garden. Glad that you are doing better, Jeff, and able to help out in the kitchen again. Thanks for your well wishes. It really is a nice thing to be able to help in the kitchen again. I thought this soup was similar to what they had at Olive Garden though I don’t remember theirs being nearly as spicy as this was though that may be just a problem with my memory. That being said, when I eat a soup three times inside a week and don’t get sick of it, it must be pretty good. Just made this — wonderful! I did substitute a can of cannellini beans for one of the potatoes. So good! Glad you liked it Lisa. I’m sure on a cold winter night we will need to make another pot of this soup.